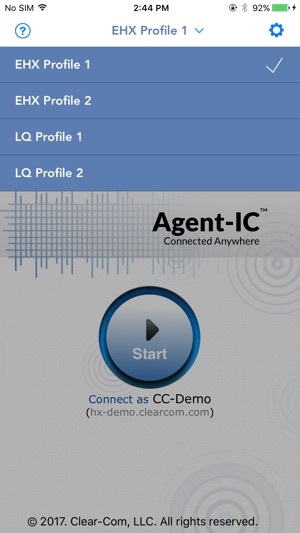 Clear-Com’s Agent-IC mobile app is designed for use with Clear-Com’s intercom systems such as the Eclipse HX Matrix Intercom, Encore Analog Partyline Intercom, and HelixNet Digital Network Partyline System. 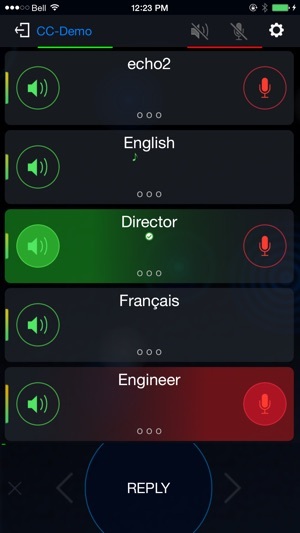 The virtual intercom control panel operates on all iPhone and iPads and connects from anywhere in the world over 3G, 4G and Wi-Fi/IP networks. 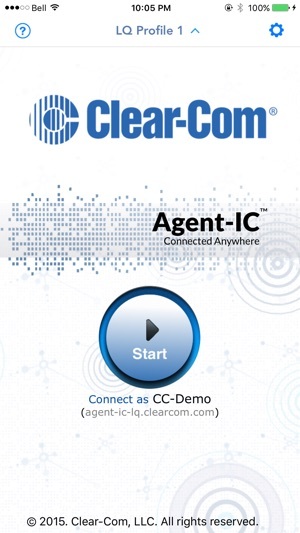 Agent-IC delivers the same user experience as traditional intercom key panels. Even on the mobile device, the app is fully featured with Point-to-Point calling, Point-to-Multipoint group calling, Partyline, IFB communications with logic triggering, PTT (Push-to-talk), local cross-point audio level control, and notifications. All communication is encrypted to AES. Agent-IC needs the Eclipse HX matrix intercom with virtual panel licenses enabled for operation. Accessing the app requires proper authorization and system pre-configuration from the organization’s system administrator using EHX. Once authentication is complete, authorized users can connect to their host Eclipse HX on iPhone or iPad as long as they are connected over any 3G, 4G and Wi-Fi/IP network. Agent-IC installation is simple. Download and install the app on the mobile device. Enter the passcode provided within EHX and authentication will begin. A unique and secure connection will be established between the device and the host Eclipse HX intercom system. Once verified, the user is ready to communicate with any traditional, IP and Agent-IC users on the host Eclipse HX network. 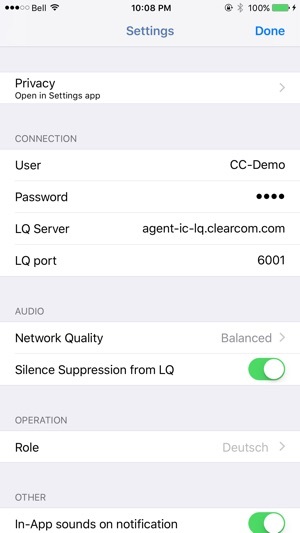 Alternatively, Agent-IC can directly connect to LQ IP interface devices in order to link to any one of Clear-Com’s partyline systems. By doing so, Partyline users can speak directly to a remote contributor user on Agent-IC. Accessing the app requires proper authorization and system pre-configuration via the LQ Core Configuration Manager (CCM). Once authentication is complete, authorized users can connect to their host Partyline system on an iPhone or iPad as long as they are connected over any 3G, 4G and Wi-Fi/IP network. Agent-IC installation is simple. Download and install the app on the mobile device. Enter the passcode provided within CCM and authentication will begin. A unique and secure connection will be established between the device and the host Partyline intercom system. Once verified, the user is ready to communicate with any traditional intercom user on the Clear-Com network. Someone just sent me this app. Not even sure what it does yet. What I do know if it's from Clear Com, it's going to be awesome. Copyright © 2018 Clear-Com LLC. All rights reserved.